Uranium is a chemical element (a metal) on the periodic table. It has an atomic number of 92, which means that a uranium atom has 92 protons in its center, which is called a nucleus. Uranium that is dug out of the ground will be made from three different isotopes: three different types of uranium with different numbers of neutrons in their nuclei. 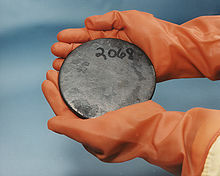 Most of it is Uranium-238; uranium-235 is less common; uranium-234 is the rarest. Pitchblende is the main ore that is mined for uranium. Uranium-235 can be used in nuclear reactors and nuclear weapons by making a nuclear chain reaction. This turns the uranium-235 into uranium-236 and splits the nucleus into two smaller nuclei. This makes two completely different elements with smaller atomic numbers. This process is called nuclear fission and creates lots of heat. This heat makes it very useful for making steam in nuclear reactors, or for making explosions with nuclear weapons. But most such weapons use Plutonium made from uranium-238. Uranium is a bit radioactive. Uranium which has had its uranium-235 taken out of it is called depleted uranium. It is used in anti-tank weapons. Uranium can also be used as a dye for stained glass or pottery, which is how it was used before people found out that it was radioactive. Uranium is a dangerous substance. Because Uranium is radioactive it is often seen with the hazard sign for radioactive elements, a group of three triangles with curved outer edges pointing in towards the middle (as you can see on the left). Some people believe that Uranium is light green, and glows, due to the way it is depicted in many movies. However, this is not true. Uranium is a shiny white metal, but is usually seen in its oxide form which is black. In addition to being radioactive, uranium is a heavy metal and is chemically toxic. ↑ Morss, L.R. ; Edelstein, N.M.; Fuger, J., eds. (2006). The Chemistry of the Actinide and Transactinide Elements (3rd ed.). Netherlands: Springer. ISBN 9048131464. This page was last changed on 14 January 2019, at 19:33.